EDINBURG — The proposed new county courthouse is facing another round of delays as the new city council here evaluates the proposed plans, but some believe the delays are more political in nature. At the center of the issue is a proposed interlocal funding agreement between Hidalgo County and the city of Edinburg — and much of the courthouse’s progress is contingent on it. For over a year now, officials from both entities have had a verbal agreement that Edinburg would give the county $30 million — or about $45 million once interest is figured in — over the course of 30 years. That money — paid in yearly increments of $1.5 million — would be put toward the construction of the new courthouse, which would sit at the center of the city’s downtown square and act as an anchor for new economic development for the city. The terms of the agreement, however, have yet to be finalized, and the issue became further complicated in November when the city had a change of leadership. Contrary to the previous administration, the new council does not appear as eager to commit to the financial deal. In fact, the new council has built somewhat of a reputation for challenging the decisions of the previous council — even though newly elected Mayor Richard Molina and council member David Torres were part of the previous council. Both, however, formed the minority faction on the previous council, and did not hold the distinction of mayor and mayor pro tem. A hint that Edinburg leaders were hesitant to enter into a deal with the county appeared last week during a special meeting of the Pharr city commission. The only item on the Dec. 28 meeting involved the courthouse. At the request of Hidalgo County Judge Ramon Garcia, Pharr leaders agreed to watch a video presentation that focused on the need for the new facility. The move is part of the county’s new initiative to meet with all 21 incorporated municipalities in the county to clear up any misconceptions about the proposed courthouse, Garcia said. After the presentation, the county judge encouraged Pharr commissioners to address any pending concerns regarding the project. Pharr Commissioner Bobby Carrillo went straight to the point. Edinburg city leaders met Tuesday evening for a regularly scheduled meeting, where they discussed behind closed doors the agreement with the county. The council, however, took no action on the matter. “We do want to partner up with the county. There’s no doubt that we’re open minded to the idea of a new courthouse,” Molina, the Edinburg mayor said Wednesday. But there are two new members on the council that need to get up to speed, he said, and he’d like to know how the county arrived at the $30 million figure for the city’s contribution. Additionally, he said, he is also interested in finding out how the price of the project went from $90 million in 2013 to the current $150 million price tag. Though, he does concede the price of construction goes up each year. County Commissioner Joseph Palacios said county leaders are willing to sit down with the new city council to discuss any concerns they might have. “Right now the total cost of the courthouse is still ambiguous in nature. So to put an exact cost to the courthouse, we’re still not at that point,” Palacios said, adding that the county is still looking at value engineering and other opportunities to offset costs through outside funding, including a $20 million allocation from the Hidalgo County Metropolitan Planning Organization to improve roadways and drainage in the city’s downtown square. But in 12 to 14 months, the political landscape might be different, and as Garcia said, elections have consequences. While the political dust in Edinburg has seemingly settled, the county has two important elections coming up in the March primary: the race for county judge and Precinct 4 commissioner. Garcia is stepping down after serving 12 years as county judge, guaranteeing the county will have a new leader come 2019. Palacios, on the other hand, is facing Edinburg school Trustee Ellie Torres, an opponent that is banking on, among other things, the success of her political allies in Edinburg to lead her to victory. 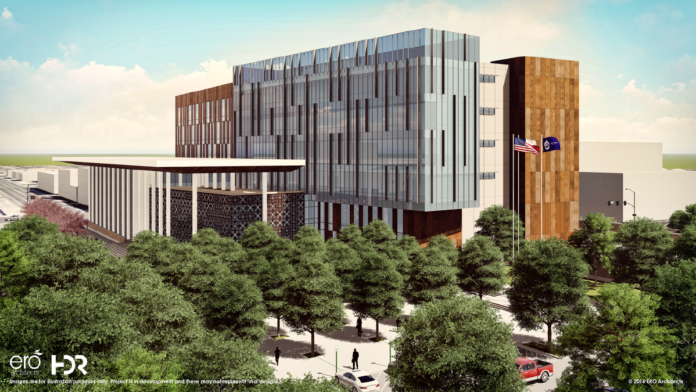 But the new courthouse has been something county leaders have been talking about for years because of the need for a new facility, and some of the plans are already in motion, Palacios said. And in a business where time is money, the project’s cost will likely increase should there be any further delays, he warned. “Much money has been spent to date and we need to make sure that we continue to stay on schedule to get this done,” Palacios said, adding Edinburg leaders should recognize the value of the project and the impact it will have on the city. The $20 million allocation from the MPO to the project will lessen the city’s burden in terms of raodway and drainage improvements, he said. The development will also spur further economic development for the city, which will be seen for years to come, he added. “That’s where we believe they get a return on their investment dollar. It’s something that they’re carrying over time,” he said. Molina indicated the new council would likely reach a decision one way or another by the end of the month or in early February. “We are going to eventually come to the table with them to discuss that,” he said. Palacios indicated he was hopeful both entities could come to an agreement after a mutual discussion.